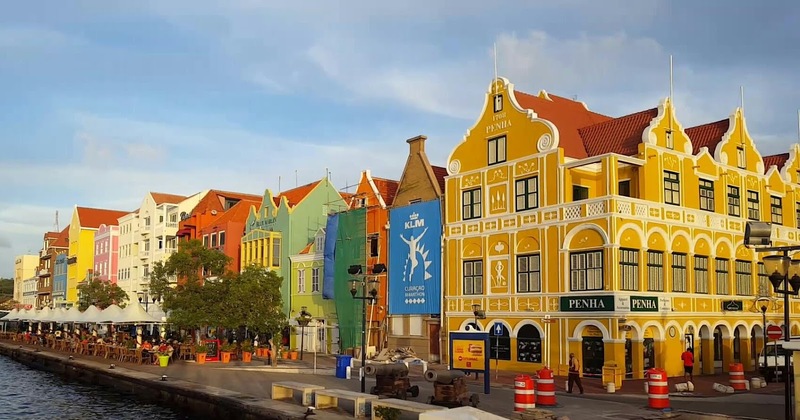 For Thanksgiving weekend we found a $100 roundtrip flight from Miami to Willemstad, Curacao. Curacao being one of the ABC islands of Aruba, Bonaire and Curacao in the Lesser Antilles. Normally a flight from Atlanta to Miami would be dirt cheap, but being a holiday weekend we had to pay a tad bit more and get a little creative on the return of Sunday, Nov 29 (one of the busiest travel days of the year). We drove to Orlando and caught a flight home from there ($200 cheaper than it would have cost us to fly out of Miami). A lot of people complain that they never find flight deals out of the city that they live in, but you gotta get creative and search for flights out of cityz that you can easily get to. How? There are lots of travel search engines, but I like www.skyscanner.com. I enter the city that I want to fly out of, leave the dates blank and the destination blank, from there I let the cheap destinations determine when I will travel. So any who, we were very back and forth about where to lodge in Curacao. Initially we went with the Hilton, but later decided to rent a condo. Thank goodness we made that decision because 1) the Hilton (and neighboring Marriott) were kinda far out and not near anything of interest 2) the Hilton looked beat the “F” up in person, like an old HOJO. After debating on the many beautiful condos we settled upon The Beach House. It was a great call because the property was intimate, beautiful, and on a great location of Mambo Beach. Mambo beach is a very happening spot with lots of dining and entertainment during the day and at night, I also hear they have a very lively Sunday beach party that we sadly did not get to attend. The main language of Curacao is Papiamento and I must say it is a very peculiar tongue. It’s a hodge podge of African, Portuguese, Indian, English, Dutch, and Spanish. When I heard them speaking I could understand like every 5th word, luckily most people in the country also speak English. We rented a car because all our research indicated that taxis are very expensive. Luckily they drive on the right side of the road because my brain cannot handle driving on the left side of the road (that was a #FAIL in the Bahamas) If u don't wanna rent a car I would recommend lodging by the port and the Queen Emma Bridge. The Queen Emma Bridge is a beautiful pontoon bridge that connects the Punda and Otrobanda districts. That area is the heart of Willemstad and you will have plenty of lodging options, lots of shopping, dining, casinos, and nightlife. I just wanna say that they likes their Happy Hour in Curacao, a lot of places have early evening happy hour and also late evening happy hour were drinks are buy 1 get 1 free. I’m not talking Miami prices of $15 drinks and you get one free, these are like $5 and you get one free #WINNING. We spent one evening at Mambo Beach enjoying the local liquors for the low low. We partied two evenings at a spot called The Alley which of course played the Caribbean/African chunes that I likey!!! It was located in the Punda district mentioned above. Entry and drinks were dirt cheap so it was definitely my kinda party! Another evening we were told that we could find the chunes that we were in search of at Zanzibar at Jan Thiel Beach, but upon arriving we heard Caribbean chunes coming from the Mojito spot next door so we let our ears guide us to the bar and then dancefloor. 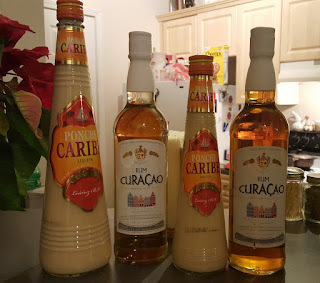 I just want to share this bottle menu from Curacao, please keep in mind that this is in the local currency which is LESS than US$. I don’t do club bottle service in the US (cause I’m poor), but at these prices I will pop bottle or two. If you don’t make it to the alcohol factory, fret not because there are plenty of shops ready to give you samples of every flavor liquor and attempt to sell you a bottle or 5. I read in numerous places that Curacao is a snorkeling paradise. 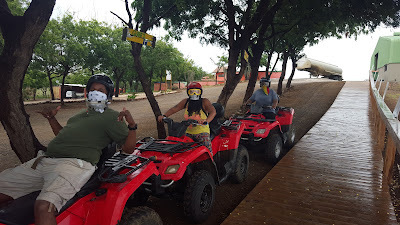 We were supposed to go on an ATV/Snorkeling excursion with ATV & Buggy Tours (they had great reviews online), but a monsoon came thru in the middle of the night and the tour was cancelled because the route was too wet. Rather than give up we went with a different ATV company (Eric’s ATVs) that didn’t have snorkeling, but did have a cave tour. 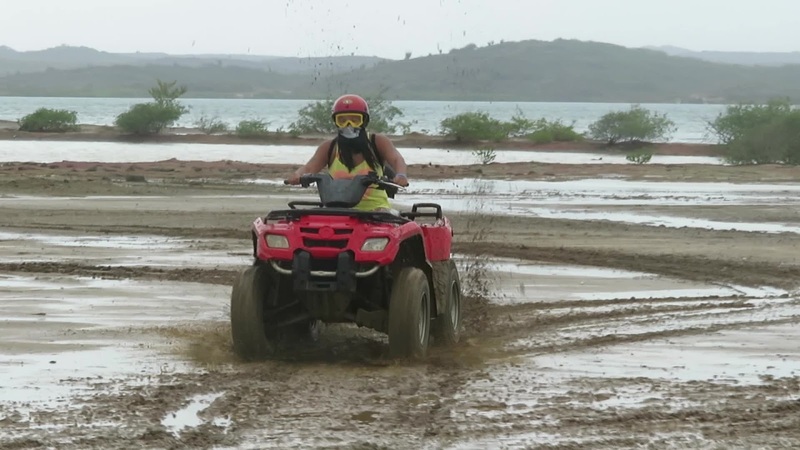 That tour was great until 2 ATVs broke down and we wasted a good hour waiting on them to try and fix them and then we had to help tow them back to base. 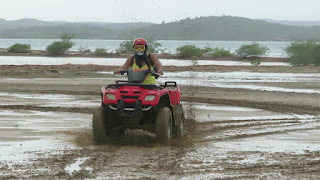 I had a great time in Curacao, there was so much more to see and do that we didn’t have time to do. If another good flight deal dropped, I was definitely go back. I must say that everyone was so dayym friendly EVEN the customs agents and that is usually NOT the case at many other countries that I visit. Even the mosquitos were friendly, usually I am bit to death (no matter how much repellent I wear), but this go round I was only bit about 3x. One thing I did find odd was the oil refinery which neighbored the center of town. You could see flames shooting from silo’s (or whatever they are called) all day long, it reminded me of the hunger games. Our first nite I saw flames shooting into the sky and thought there was a big forest fire and we were all going to burn to death (I can be a tad bit dramatic at times). They love to add a Caribbean /Latin/ African beat to American chunes (something I rather enjoyed). I was dancing my life away to artists I would normally never dance to back home. The men love and I mean LOVE their murses (man purse), apparently if you don’t have a man purse you don’t have your life together! I love your blog!!! Your trip sounds great and affordable. I love learning from others. I definitely would like to visit.